Last night, I had a strange experience. I was staying in Italy with very good friends. One of them had brought along his 10 year old son for the weekend who, being 10 years old, wasn’t quite as enthralled with the architecture and vistas on offer in the Italian countryside. In fact, like the majority of modern 10 year olds, any period of time away from his iPad connected to Minecraft, Angry Birds or the latest awful Transformers offering from movie director Anti-Christ Michael Bay was met with foot-stomping protestations of boredom that not even Italian ice-cream could suppress. That night while the ‘grown-ups’ were having dinner we decided that to keep our nipper occupied we would stream a movie onto the TV. We went through a series of options. Would we serve up another Transformers-style CGI-fest like Avengers: Age of Ultron? Or Iron Man? Perhaps he’s nearly old enough for something slightly darker from Christopher Nolan’s excellent Batman series? Upon checking with the IMDB and rather excellent BBFC website we figured it may be just slightly beyond his maturity. In the end, I recalled the movies that had impacted me at that age. What had stuck with me. What had stood the test of time. What, when I looked back to the young me, was burned into my memory as a landmark movie. Jaws, the 1975 classic, which has recently celebrated it’s 40th birthday, stood out as a big influence. 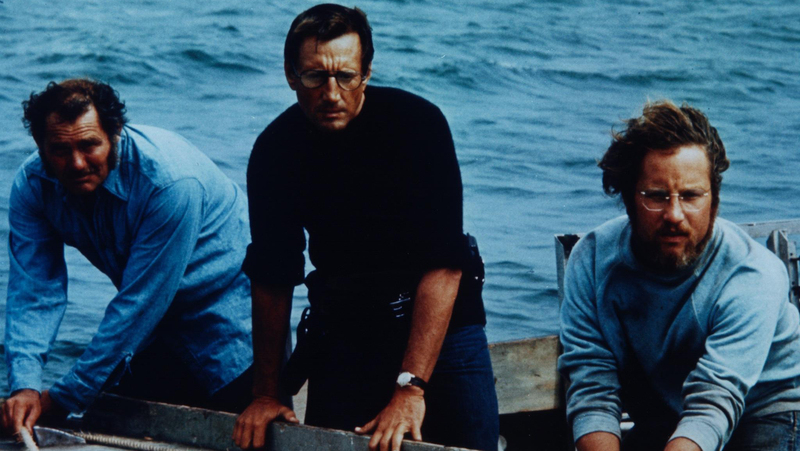 Regarded by many as the first summer-blockbuster-popcorn-movie, Jaws transcended it’s genre – as the best movies do – and became a cultural phenomenon. Like many of my generation, I can still remember this film being broadcast on TV when I was a child of that age. At first scared and watching from behind a cushion, as I grew the movie grew with me. Forgetting it’s lamentable sequels, I still love it today. And although it is not without flaws, without any hint of irony, will happily cite it as one of my favourite films. So what’s great about it? Well, in many ways, it’s the first ‘family’ horror movie – if there is such a thing. Although only a PG rating in the UK originally (now reclassified to it’s 12A modern equivalent) there is something tense and shocking about it even today- whether it’s a 10-12 year old meeting the movie for the first time. Or, at the other end of the spectrum, granny watching it on boxing day while munching on a mince pie. It has the ability to captivate each generation. Some of that brooding sense of threat that the movie has is a happy accident. Something serendipitous making the film greater than the sum of it’s parts. The rubber shark that they had lined up to play the title role (nicknamed ‘Bruce’) malfunctioned during production. It simply wouldn’t work. This had a few side effects. Firstly, it meant that under pressure to complete the film under schedule, and with the studio breathing down his neck, Spielberg was forced to shoot large sections of the movie shark-less. This meant that legendary composer John Williams had to effectively become the shark. In fact, for the first half of the movie the shark is not seen. It’s heard in the form of John Williams’ cello. And a healthy does of Hitchcockian suggestion from Spielberg. As with many good horror or sci-fi movies, Jaws has said to be allegorical for a bigger issue. Over the years Jaws has been said to be about variously; the Watergate scandal, the atom bomb, that the shark represents a sexual predator or serial killer, it’s a parable on the need for order in society, a morality tale, representing science (Hooper) vs. religion (Quint) in the face of the common man (Brody), the three aspects of the human psyche Parent (Quint), Adult (Hooper) and Child (Brody) engaging, the unreality and sanitisation of modern life and (inevitably for a film of this era) the dread of spreading communism. Secondly, the three main protagonists in the movie; Quint, Brody and Hooper, famously clashed on set. Accounts vary as to why that may have been the case. 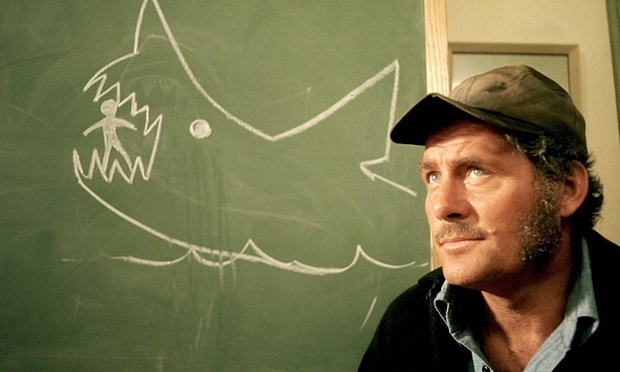 Some say it was a deliberate ploy from hardened actor Robert Shaw to create tension on the set. Part of his plan. Others say that Shaw – known to enjoy a drink – simply didn’t get on with Richard Dreyfuss and Roy Scheider. Whatever the reasons, the tension between the actors seems real and palpable. Critics and academics have picked over the meaning of the film for decades since it’s release. What the film represents. The psychological representation of the three main characters. Why it effects people so profoundly. Why it has succeeded where other haunted house and monster movies have failed. Let’s face it, no-one is picking over the cultural significance of The Swarm, Piranha or Lake Placid which, essentially, try (and fail) to tread the same ground. Whatever it’s draw – and I’m probably not smart enough to give a reasoned response – it still works. 40 years on in October 2015 I sat next to my friend’s son as he watched the movie and he was enthralled. He jumped as the ‘face’ appeared in the bottom of the wrecked fishing boat. He yelped as the ‘monster’ burst through the hull of the boat in the final act. The film works. So what was strange? Well, across at the other end of the sofa were two other friends of mine. Mature, intelligent adults. They were scowling. Arms folded. They hated it. They said it was sh*t. When asked to elaborate the reasoning was that, a) it wouldn’t happen – in the real world the shark would have been dealt with in the opening act. No shark behaves like that, b) in the final act the actors laugh in relief at having survived the final ‘confrontation’ before hanging their heads at news of Quint and c) the violence is gratuitous – and the characters should have been sobbing for the tragedy that had just happened. This was a strange reaction. Let’s be clear and put a couple of flags in the sand at the outset. These guys who objected to the film are not prissy or prudish people. They are progressive in their views and taste in film. In fact, earlier in the week we’d been discussing some of the more recent Lars Von Trier offerings – and you would struggle to get more controversial than that. They also usually have a profound understanding of art and what gives something impact. It therefore seemed odd to me that they would be so revolted by the movie for several reasons. Firstly and most importantly, this is a horror/fantasy movie. Somehow, in watching the film, they seemed to have blurred the line between fantasy and reality. The shark in Jaws is no more real than the bees in The Swarm, the crocodile in Lake Placid. Shark behaviour is well documented and the personal attacks on the Orca vessel or it’s crew bear about as much relationship to reality as the autonomous and sentient VW Beetle in the Herbie movies. In the final act, yes, the characters laugh in relief at their apparently miraculous survival against the odds. And then hang their heads as Brody confirms to Hooper that there has been an unfortunate event involving Quint. It’s a fleeting moment. But this a popcorn movie not intended or expected to be based in reality. It has no duty to explore the reality of the human condition. The film is a form of escapism to transport you from reality for 2 hours, not a therapy session. In reality, of course, the protagonists of the action would be traumatised by events. Their reaction would be different, I’m sure, to that shown in the film. However, in movie world, their reaction is no more unrealistic than the whooping of Luke Skywalker – as thousands perish – as he destroys the death star. Or the grin of the cinema crowd as Indiana Jones casually shoots in cold blood the sword-carrying assassin in Raiders of The Lost Ark. Inevitably there is death and destruction in these type of action movies. But it’s dealt with in a very tongue-in-cheek, cartoon way. To worry about the morality of Hooper and Brody’s reaction to Quint’s demise is akin to getting caught up in the moral dilemma of what will become of the wives and children of the Nazi soldiers crushed under wheels of trucks in Raiders of the Lost Ark. Or the assassins and henchmen disposed of by James Bond during his last mission. Children are smart and understand that real-world situations are different to the fantasy and schlock of on-screen situations. Jaws, for all it’s supposed gore or gratuitity, is surprisingly low on blood. We see one unattached leg. The ghostly face of a befallen fisherman poking out of the hull of a boat. And, a final act in which one of the main protagonists is swallowed with the inevitable tomato ketchup moment that ensues. That’s it. Compared with the body count and gruesome endings that some of James Bond or Indiana Jones’ adversaries meet, this is positively tame. The rest is suggestion. The rest is threat. Perhaps the visceral reaction my friends had to Jaws is not a reaction to how bad it is. Perhaps it’s an adverse reaction because it’s a bit too close to reality for their tastes. Had it had a more ‘cartoon’ element, their reaction may have been different. However, great art, as Penn Jillette rightly said, “…is to collide the intellectual and visceral together at the highest speed possible.” This is how magic tricks work in his world. This is how a roller coaster works. Your visceral senses are telling you that hurtling down the track at great speed you are in danger. Your intellect tells you that you must be safe – thousands of people ride this roller coaster each year. If it was genuinely dangerous they wouldn’t be in business. And that’s Jaws. A roller coaster. A 40 year-old roller coaster. Your senses tell you there is danger. That the shark will destroy them. That the characters you’re invested in are in mortal danger. Your intellect by contrast, tells you that sharks are neither that large nor able to board boats and destroy the crew. This is fantasy. A ride. For me, Jaws is the epitome of this. And, 40 years after it’s original release, it still had the power to thrill a 10 year old boy I know.